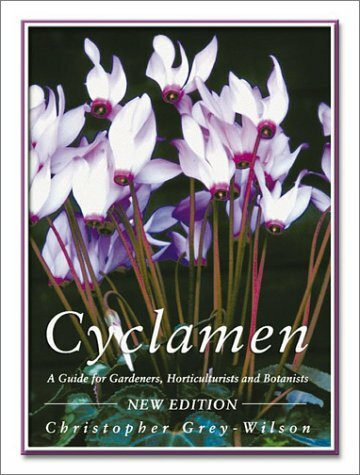 A completely revised and updated edition of the most comprehensive study of the genus Cyclamen ever undertaken, this book covers species both in the wild and in cultivation, along with analyses of the many cultivars. The book is beautifully illustrated with 200 color photographs as well as line drawings and maps showing the distribution of the various species in the wild. Detailed notes on cultivation and propagation are provided. Using a minimum of botanical jargon, it tells all those with an interest in the subject everything that they may need or want to know about this fascinating genus. A completely revised and updated edition of the most comprehensive study of the genus Cyclamen ever undertaken, this book covers species both in the wild and in cultivation, along with analyses of the many cultivars. Christopher Grey-Wilson has been the Editor of the Alpine Garden Society since 1990, and is also a freelance horticultural writer and photographer. For many years he was a Principal Scientific Officer at the Royal Botanic Gardens, Kew, working as a Research Botanist, and as Editor of Curtis' Botanical Magazine. He has been on a number of major botanical expeditions in pursuit of the mountain floras of Europe and Asia, particularly those of the Himalaya and southwest China. He is the author of several books regarded as standard works, including The Genus Cyclamen, The Illustrated Flora of Britain and Northern Europe, How to Identify Wild Flowers, The Alpine Flowers of Britain and Northern Europe, A Manual of Alpine and Rock Garden Plants, and The Alpine Garden. Recently published by B.T. Batsford is his comprehensive work Clematis the Genus. He serves on a number of committees of the Royal Horticultural Society, who recently awarded him a Gold Veitch Memorial Award.